The natural fracture of rock has a strong effect on the law of explosion stress wave transmission and crack propagation during blasting. Based on the stress wave theory, the influential mechanism for both the law of transmission of the stress wave and of crack propagation due to natural fracture and water jet slot are analysed. 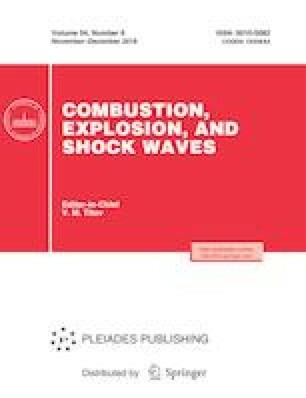 Next, an experiment is conducted to understand the crack propagation law because of the effect of an explosion shock wave, and the evolution law of the blast stress wave and blast-induced crack propagation is simulated by ANSYS/LS-DYNA. The results indicate that the existence of the water jet slot not only promotes the generation of the main crack along its direction, but also promotes the generation of the secondary crack near the water jet slot because of the explosion shock wave. The direction of propagation of the secondary crack and the main crack are seriously affected by the natural fracture. In addition, if the distance between the blast hole and the natural fracture is too small, a smash area is formed; and with an increase in the distance between the blast hole and the natural fracture, the smash area becomes smaller, and the effect on the blast-induced crack becomes weaker. Original Russian Text © D. Su, Y. Kang, F. Yan, D. Zheng, X. Wang, M.Wei. Published in Fizika Goreniya i Vzryva, Vol. 54, No. 6, pp. 131–140, November–December, 2018.